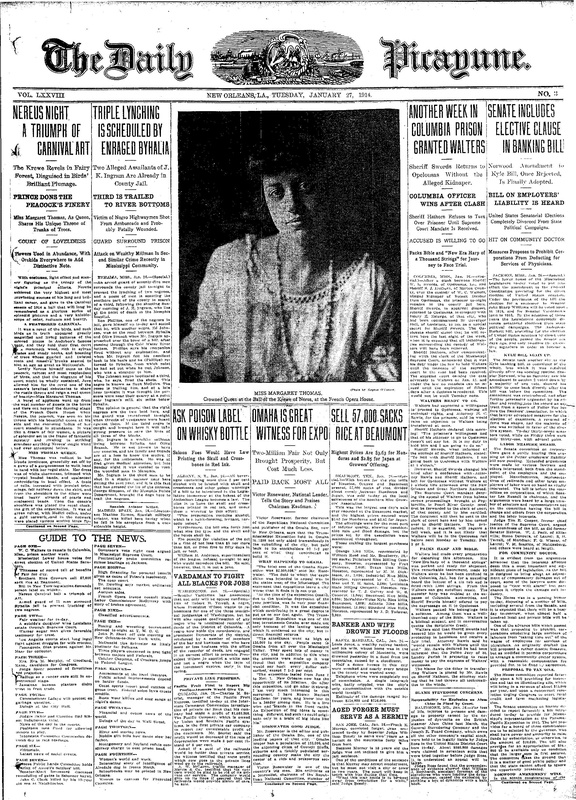 Killed February 16th, 1914, near Hernando, MS. McGuire (possibly McQuirk or McGuirk) was taken from police custody during transport to jail. The officer in charge of transporting the prisoners was reportedly held at gunpoint by a group of ~50 men, who stopped the train they were travelling on. 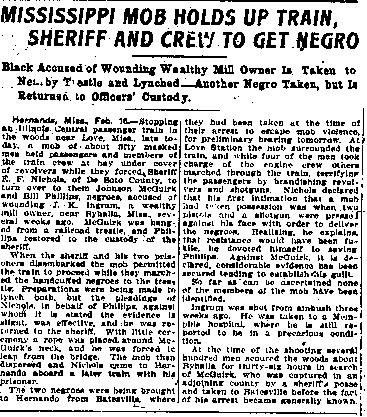 The officer actually had two prisoners with him, but he prevented the group from lynching the second man, telling them that there wasn’t much evidence against him. He then returned to the station with his remaining prisoner and caught the next train. 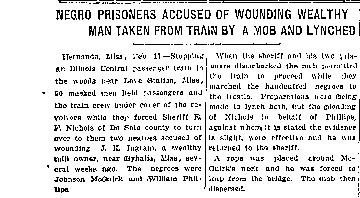 The officer had fore-warning that a lynching would be attempted, was held at gunpoint, left the train in the company of the lynchers, witnessed the lynching of McGuire, convinced the mob not to lynch the other prisoner, and then they parted ways. 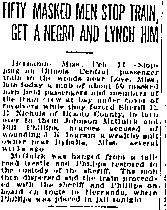 Despite this extensive interaction between the lynchers and the officer, he claimed later that he could not identify anyone who participated in the lynching. No charges were levied against anyone involved in McGuire’s killing, nor was the officer disciplined for losing custody of his prisoner. This incident is discussed in a number of sources. Click and zoom in to read, or download the PDF below each image.